Last month Andrew Bennett and I gave a talk at Collaborate on the use of Enterprise Manager to monitor WebCenter Content instances. For those of you not familiar with (or confused by the branding of) Enterprise Manager, in this case we are talking about the lightweight version of EM that installs by default as part of the WebLogic Server install. However, if you have a full installation of Enterprise Manager the following discussion will also apply to you, as long as you have the right management packs installed. We were assisting a client in Australia with performance testing their deployment. Their intranet architecture has a WebSphere Portal accessing WebCenter Content using RIDC to retrieve Site Studio generated content in portlets, Blog and News content. During testing the WebSphere Portal server was crashing under load and that team claimed that WCC was not responding quickly enough to requests and causing connections to hang. Using EM (actual output below) we could demonstrate that requests were not reaching the WCC server, and that when they were, the server was responding extremely quickly – never more than 45 ms. Using this evidence we were able to show that the cause of the issue was within the WebSphere Portal server itself and help in resolving the problem. 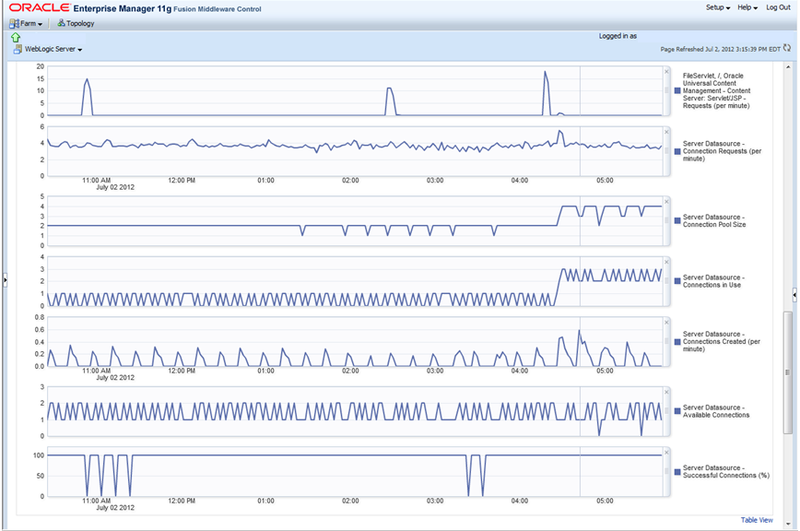 At another Wall Street client we have been using Enterprise Manager to monitor system performance during large archive imports during a migration. We were occasionally seeing archiving errors where the Archiver was unable to update the revisions rank when importing new revisions. The fault was intermittent and did not appear to be related to load, time of the day, or other system activity. Using EM (output seen below), we were able to demonstrate that the issue was caused by an intermittent network fault that caused connectivity to the database to be lost briefly at random times (bottom graph). Working with the database and network teams we were able to resolve this and avoid spinning our wheels searching for faults in the WCC solution. TEAM is finding that Enterprise Manager is an extremely valuable addition to our troubleshooting toolkit – particularly in large and complex deployments. I strongly encourage you to explore the capabilities of this valuable tool and, of course, if you need assistance in monitoring, documenting, upgrading, tuning, or troubleshooting your Content Management solution, TEAM would be delighted to help you. This entry was posted on Tuesday, July 3rd, 2012 at 10:32 am and is filed under Oracle, WebCenter Content. You can follow any responses to this entry through the RSS 2.0 feed. You can leave a response, or trackback from your own site.